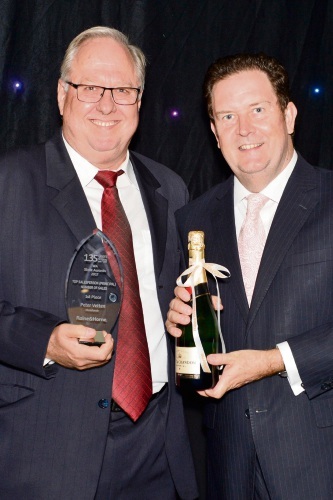 Angus Raine (right) presents Peter Vetten with one of many awards for Raine & Horne Mandurah. RAINE & Horne Mandurah has again dominated the network’s WA Awards for Excellence, winning a swag of accolades at this year’s event. Hosted by executive chairman Angus Raine, the night at Crown Perth celebrated the annual awards and Raine & Horne’s 135th anniversary. For the third year, Mandurah was named top office in the number of sales and dollar value categories. “This is a tremendous effort by principal Peter Vetten and his team, who are regularly among our best offices in WA,” Mr Raine said. Mr Vetten achieved individual success in the principal categories, winning the top salesperson for number of sales and dollar value awards. Selling agent Randolph Watson triumphed in the top salesperson for number of sales category. Other winners from Raine & Horne Mandurah included Gavin Paton, who was named outstanding property manager, and Diana Gilbert for outstanding office support.